Posted October 9, 2012 by Tim Lepczyk & filed under Ernest Cline, Novel, Novel Reviews, Reviews, Science Fiction. Ernest Cline‘s Ready Player One is a futuristic geek-fest that revels in the 1980’s subculture of video games, Dungeons & Dragons, comic books, science fiction (novels and films), and cartoons. If you like these things and you’re intrigued by a dystopian future where people forego reality for virtual reality, then this book is for you. The novel is fun, fast-paced, and addictive. People in the novel log into a virtual reality called OASIS. There are thousands of worlds in the OASIS and they are created around individual’s obsessions. Imagine something immersive like from the Matrix, but not as real. Then, imagine people having avatars and leveling up like in World of Warcraft or any other RPG. Take that image a step further and picture a world where all of the games are meshed into one universe and there are few bounds. See it? If you don’t, that’s fine, because Cline certainly sees it and aptly creates it in Ready Player One. The plot of the novel is simple. The creator of the OASIS is dead. He’s eccentric and in a Willie Wonka way turned his inheritance into a game. Whoever can decipher the puzzles, beat the levels, and find the Easter egg he’s hidden in the system will take over his company, inherit his wealth, and control the OASIS. Things get complicated when the evil, corporate telecommunications conglomerate IOI puts together a whole division committed to finding James Halliday’s Easter Egg. With the fate of the world and the virtual universe up for grabs, who will win? Read the novel and find out. It’s an escape, you may wish to lose yourself in. Posted October 3, 2012 by Tim Lepczyk & filed under Books, Creativity, David Mitchell, Experimental, Novel, Novel Reviews, Reviews, Science Fiction, Social Commentary, Structure, Style, Time, Voice. That works better than a blurb. It’s a messy novel and deserves a messy description. And yes, I mean that in the best way possible. If Cloud Atlas is all of these things, then what is Cloud Atlas? Posted September 24, 2012 by Tim Lepczyk & filed under Dave Morris, eBooks, Horror, Novel. I’ve long had a fondness for Choose Your Own Adventure books. As a kid, I’d sit on the floor, mesmerized by the pulpy covers and unknown outcomes. The storylines were simple and similar to Hanna-Barbera cartoons. Unlike a cartoon though, it was me in the story, imagined through a second-person perspective and the endings were often gruesome. Shaggy and Scooby would never be impaled through the chest by a Native American spear, or die of thirst, alone in the desert while vultures spiraled in the sky. Interactive texts are not new, but the technology with which to create them is changing. Inkle has a service called Inkle Writer, where people can create their own interactive texts. It’s slick. It’s intuitive. You should have some fun with it. How they’re delivering these texts is also new. No more worn covers and marking decisions with multiple fingers. Currently, they’ve taken an interactive story by Dave Morris based on Mary Shelley’s novel, Frankenstein, and created a beautiful app, available through iOS. It’s engaging, it’s fun and it is yet another example of how technology is changing writing and publishing. Further, it leads to the following question: is a writer who creates an app for their work a novelist or a developer? To hear more from Dave Morris and this latest creation that exists among us, check out his interview on Here and Now. Posted September 19, 2012 by Tim Lepczyk & filed under Curriculum, Education, English, Higher Education, Publishing, Writing. It’s been eleven years since I completed my undergraduate education. The Internet had upended the music industry during that time, but not writing and publishing. The information economy was dwarfed by fears of Y2K, when airports would shutdown, power plants would go offline, and we’d all be waking up with a killer hangover. The term, web 2.0, did not yet exist. Posted September 10, 2012 by Tim Lepczyk & filed under Charles Portis, Novel Reviews, Reviews, Southern Fiction. Charles Portis‘ novel The Dog of the South is a dialogue-driven narrative told from the perspective of a young man from Little Rock, Arkansas during the late 60’s or early 70’s. The narrator, Ray Midge, belongs in the company of such characters as Ignatius J. Reilly, characters whose voices are strong, outside the mainstream, and blunder through life either unaware or uncaring for how others see them. Midge is uptight, conservative, and drives the reader between bouts of laughter and annoyance. It’s a fine line and Portis seems acutely aware of the tension Ray Midge creates. The novel follows a simple enough premise that is absurd on face value. Midge is in pursuit of Guy Dupree who has stolen Midge’s Ford Torino and credit cards, and run off to Mexico with Midge’s wife, Norma. What’s Midge most concerned about? Why, the car of course! Midge has Guy Dupree’s less powerful 1963 Buick Special, a pistol packed in a cooler of ice, baloney, and beer, as well as an inability to comprehend why people find him tedious. It’s not quite Don Quixote tilting at windmills, but both men are fairly deluded. Through the meandering narrative, Portis’ love for language and dialogue spills from the pages. Midge and Dr. Symes, a scoundrel Midge picks up in Mexico, partake in many conversations where the other man is talking at or past the other one. It’s funny. It hits the right cadence. It may go on too long. The risk of course is wearing out the reader’s patience. If you’re looking for a change of pace or a unique voice, I recommend reading The Dog of the South. If Midge and Symes start to annoy you, take a break and come back to the novel, this isn’t one to quit and forget. Posted August 17, 2012 by Tim Lepczyk & filed under eBooks, iBooks, Internet, New York Times, Publishing, William Gass. William Gass’ new book is only available through iBooks. There’s a wonderful introduction and interview with William H. Gass titled “A Champion of the Book Takes to the iPad” on the NYTimes Bits Blog. The interview focuses on the new book, Abstractions Arrive, which was published by Stephen Schenkenberg who also runs the website Reading William Gass, and the decision to make it an electronic book exclusively through iBooks. Posted August 8, 2012 by Tim Lepczyk & filed under Fantasy, Novel, Novel Reviews, Reviews, Steven Erikson. Is it just me, or did Kurt Warner pose for this book cover? How does one critique a book? Examine the writing, the mechanics, the beauty of the written word? Or, does one take another approach and view the enjoyment and pull of the narrative? Steven Erikson‘s novel, Gardens of the Moon, was enjoyable. It ventured away from that staid plot device: the young hero from nowhere who defeats an empire. 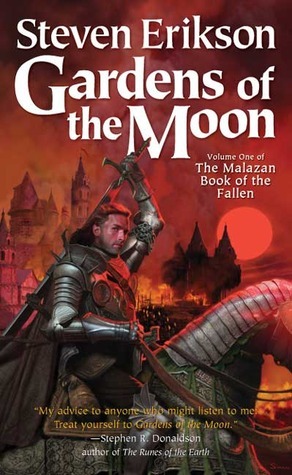 Instead, Gardens of the Moon shifted perspective among a cast of characters that included various factions from a powerful empire and a mixture of people from a rebel city. As the series moves forward, Erikson has given himself a lot with which to work. The series (Malazan Book of the Fallen) seems ambitious in breadth. From my understanding the series moves in such a way that some characters carry over, while others fade away. This seems like a smart move and allows Erikson to focus on the story he wants to tell. The end of Gardens of the Moon was fairly complete as well. While it certainly leads into the next book, it’s not dependent on what happens in the future. In other words, one can read this first book and feel satisfied. Satisfaction comes at a price though. While I mentioned that Erikson avoided some of the pitfalls of fantasy, he did manage to fall into a another trap: poor writing and mechanics. I liked the story; it’s true, but I found it hard to read due to Erikson’s writing. Transitions are few, descriptions are flat, changes in perspective are disorienting, and Erikson does not seem to understand the usage of commas and semicolons. Those items are what’s stopping me from reading the second book. In the cost/benefit ratio of reading, do I want to put up with all those deficiencies for the story? Is it too distracting? If you’ve read the this novel or others in the series, let me know what you think. Does the writing get better? Posted July 24, 2012 by Tim Lepczyk & filed under David Guterson, Novel, Novel Reviews. David Guterson’s, Snow Falling on Cedars, is a quiet, contemplative book that depicts both the isolated life of the San Juan Islands and the racism Japanese immigrants experienced before and after World War II. Posted July 8, 2012 by Tim Lepczyk & filed under Fantasy, Glen Cook, Novel, Novel Reviews, Reviews.